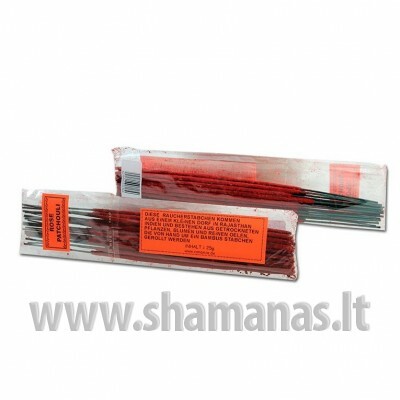 These incense sticks are made in a village in Rajasthan, India and consist of dried plants, flowers and pure oils which are manually rolled around a bamboo stick. This delicate blend of fragrances with high quality is brought to you from India as part of the esoteric range. These incense sticks are a type of incense, traditionally, most often burned before an Indian religious image, idol, Buddha statue, or shrine. In modern days, the burning of joss sticks can be used for any type of purpose, such as to enhance the smell of a room. Light the incense stick on top, blow out the flame and fit the stick in an incenst stick holder. Don’t bring the glowing top and the hot ash in contact with flammable things. Don’t let the sticks burn without supervision.